In the Diocese of Leeds, which is the diocese where I live, it has been decided that there will only be one coach per deanary travelling to Cofton Park for the beatification of John Hehry Newman. It seems that the same policy is being adopted in the Middlesbrough Diocese. If the same policy is adopted throughout England and Wales, by my calculation, the number of faithful permitted to attend the ticket only beatification will be limited to about 15,000. Originally, it was estimated that 400,000 would wish to attend, although Coventry Airport, the location proposed originally, could only accommodate 200,000. When it was discovered that Coventry had not been booked, it was leaked that the organisers were considering holding the event at Oscott College which could only hold 10,000. After a storm of protest Cofton Park, which was said to be able to accommodate 80,000, was booked. Now it looks as if the number of the faithful allowed to attend the ticket only event will be limited to about 15,000. Several of these would be regarded as not being particularly friendly towards the usus antiquior. Who will be their successors and will they be better disposed towards the traditional liturgies? Who would you like to see ordained a bishop? Suggestions please. Fr Maughan tells me that following the success of the Masses in Scarborough and Hull, he is being asked to say a traditional Mass in Filey. No date has been fixed yet, but it will be posted here as soon as arrangements are made. The Latim Mass Society has made a major contribution to the promotion of the older form of the Mass by providing training opportunities for priests wishing to learn the rubrics of the traditional Mass. In the last three years, five training conferences have been organised and a forther one will take place in August at Downside Abbey. Over 100 priests have attended these conferences, the vast majority of whom now celebrate in the usus antiquior at least occasionally. 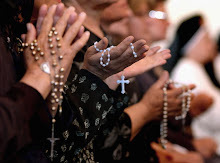 Although these conferences can be credited with allowing the number of traditional Masses to increase, they can only be a partial solution to the problem, which is a desperate shortage of priests with the skills to celebrate in the usus antiquior. 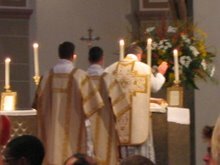 The proper solution must be surely be for the seminaries to teach both forms of the Mass and the third anniversary of summorum pontificum would be a good time for this to start. Both of these Masses were a great success. The previous entry includes a link to some pictures of the Hull Mass, and I think more will be posted soon. The medieval music was quite exceptional and different from anything I had ever heard before. Also very gratifying were the attendances. I think about 60 at Scarborough and 140 at Hull. Everyone seemed very enthusiastic and many asked when the next one would be. Both churches are very suitable for the older rite and the sanctuaries had been well prepared. Some photos from yesterday's superb Mass can be seen here. Some came out better than others! More will be uploaded later.